New Beginning is a fantastic title for this little wonder. I have not painted all too often for the past year. I did hand paint my Christmas cards which perhaps sparked my interest in watercolor painting again. 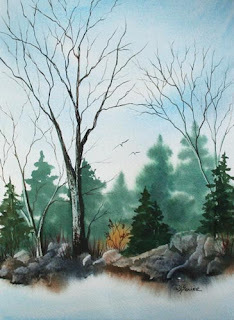 I do absolutely love to paint especially in watercolor a rather challenging medium. Hopefully this fresh start and new beginning will continue and I will be back to doing what I love doing best. Painting watercolors, experimenting in other mediums and also teaching and giving out watercolor painting tips. Beautiful start for a new year! Well done!